These puppies have found their forever homes. High Caliber Shilohs and Brick Chapel Shilohs are very proud and excited to announce the upcoming breeding of two fantastic Shilohs, Terra and Kilian. 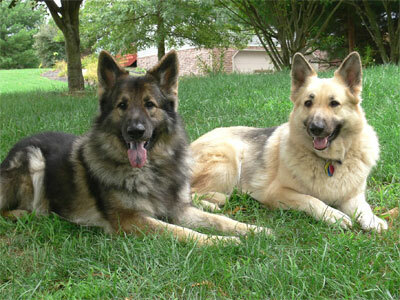 Beauty, brains, and brawn, plus outstanding health and confident, gentle temperaments, this pair has it all! Kilian is a handsome brown sable with a thick plush coat, nice small ears, and a proud bearing. 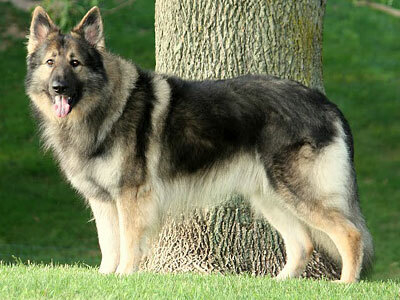 He has a wonderful head and tail, nice bone and width of chest, as well as beautifully balanced structure. His conformation titles (Rarities/NAKC, Breed, and ISSDC), four National Select awards, Adult Temperament Test and Canine Good Citizen certificates help prove that he possesses exceptionally good structure and temperament. His calm and dignified demeanor further serves to make him a very impressive Shiloh and with great health testing to top it all off, Kilian has much to offer our breed. Terra is our beautiful and sweet girl who loves everyone and everything! From conformation and temperament, to intelligence and health, we could not be more pleased with our lovely young lady. Terra is a very smart girl with lots of substance, a gorgeous blocky head with nice ears and a sweet expression, wide chest and good bone, thick coat and beautiful tail. Terra has also earned several conformation titles (NAKC, Breed, ISSDC, and IABCA), four National Select Awards, a Top Dog Award as well as certifications for Canine Good Citizen, Adult Temperament Test, Therapy Dogs International and Herding Instinct. She is the calmest and gentlest Shiloh in our pack and always has a smile on her face, yet she is still game for a hike or swim or an agility class anytime. It is with great anticipation that we look forward to what Terra and Kilian will produce together. We are so pleased with our last litter from Terra’s half-sister Kiana to Kilian that we decided to use him again. Both Terra and Kilian have produced several champions, grand champions, and even a Grand Victrix each, as well as progeny that have earned their therapy dog certifications! We expect some top notch show and breeding prospects from this litter as well as excellent companions and therapy or service dog prospects. 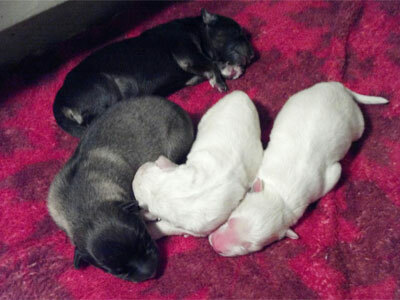 Solid, steady temperaments, broad heads and chests and heavy bone are what we will see in these puppies. If you are interested, please contact me soon to reserve yours.